Silver Kookaburra coins from the Perth Mint are among the most popular coins with those precious metal enthusiasts that buy silver. The Silver Kookaburra debuted from the Perth Mint in 1990 with additional weights added in 1992. Among the weights added in that year was the 10 oz Silver Kookaburra. Today, you can purchase 10 oz Silver Australian Kookaburra Coins online at Silver.com from random-year lots. Available to ship inside of protective packaging! Consists of Ten Troy ounces of .999 or .9999 fine silver. The face value of $10 (AUD) is fully backed by the Australian government. Queen Elizabeth II features on the obverse. Kookaburra species found on the reverse. Please note you may receive several coins with the same date mark when buying more than one coin in this listing. 10 oz Silver Australian Kookaburra coins were introduced in 1992, two years after the debut of the series in 1990. The coins are initially issued by the Perth Mint with unlimited mintage figures in each year, meaning only that the 10 oz Silver Kookaburra is struck to meet the demand of buyers through the end of the calendar year matching the date mark on the coin. Mintage figures were the lowest in this weight in the early 2000s before the Great Recession and peaked during the Great Recession. All of the 10 oz Silver Australian Kookaburra Coins in this listing comes with protective packaging and are offered to you as random selections. 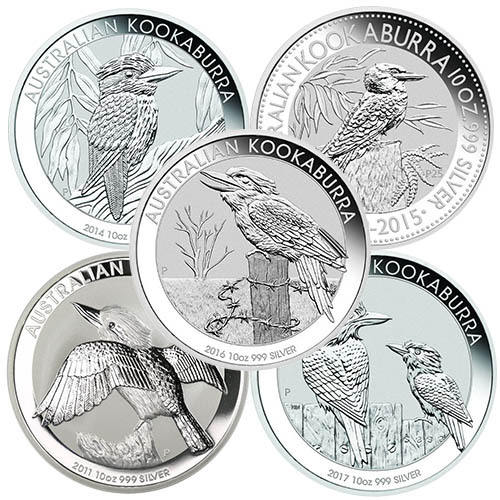 When your payment is processed our warehouse team will select a 10 oz Silver Kookaburra for you based on availability. As such, you may receive several coins with the same date mark and design when you buy multiples. On the obverse side of 10 oz Silver Australian Kookaburra Coins is an effigy of Queen Elizabeth II. Australia has used a total of six different portraits of Her Majesty since 1953 following her coronation. For the 10 oz Silver Kookaburra, possible portraits include the third-generation design from Raphael Maklouf (1990-1997), the fourth-generation design from Ian Rank-Broadley (1998-2018), and the fifth-generation design from Jody Clark (current). The reverse of 10 oz Silver Australian Kookaburra Coins also features varying designs. Unlike the Queen’s effigy, the design of the kookaburra changes every year. The kingfisher is commonly found throughout the Outback and its human-like laughter is unique among other animal species. Another important note about 10 oz Silver Kookaburra Coins relates to purity. The 1992 to 2017 issues of the 10 oz Silver Kookaburra have .999 fine silver content, while 2018 and onward coins have .9999 fine silver. Please don’t hesitate to reach out to Silver.com with your questions. You can call us at 888-989-7223, chat with us live online, or simply send us an email.